You have the dress you want. Maybe it doesn’t fit right, or – depending on the time of year – you may not want the train because there is snow on the ground. At Amazing Alterations we have done some really beautiful transformations with gowns, turning a beautiful dress into a simply stunning gown! 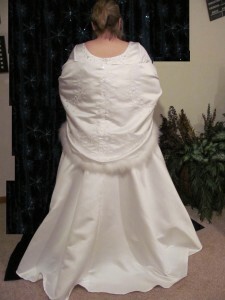 Here is one of the transformations that have been done with the train of the wedding dress turned into a stunning winter cape. 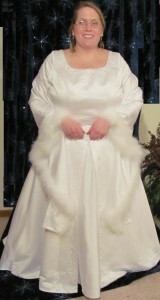 Wedding dress with train turned into a sequined, maribou fur trimmed cape. A wedding gown transformation like the one above makes the gown easy to wear, without the train in a winter wedding, and still gives the bride a beautiful accessory to accompany her gown. 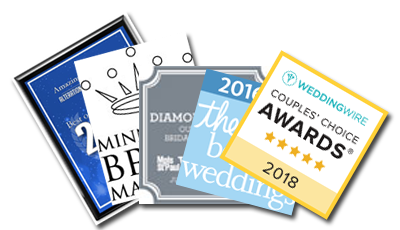 If you want to customize or transform your wedding gown, but aren’t quite sure exactly what you want to do, call us today! Our experienced, talented designers will create the perfect look for you! 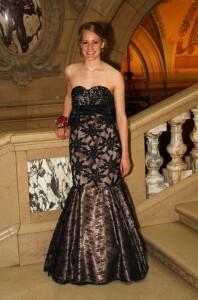 Located in Anoka MN, Amazing Alterations is available to schedule your dress alteration consultation today.